Marc Canter knows Guns N’ Roses like few people do, outside of the band members themselves. The childhood best friend of Slash, Canter was there for many of the early moments in the group’s history. He supported them both emotionally and financially, taking photos and recording video of early gigs and tours. He even wrote a book about that time, called Reckless Road: Guns N’ Roses And The Making Of Appetite For Destruction. Now, he’s on a mission. 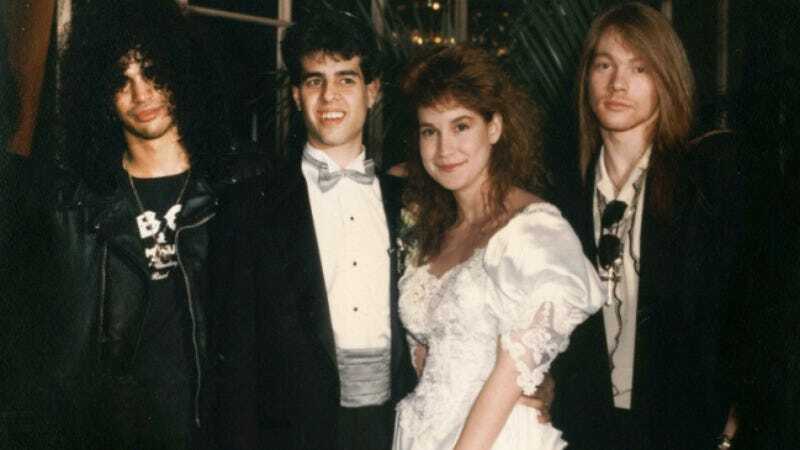 It’s been almost 20 years since Axl Rose and Slash have even spoken, but Canter has a plan to get his old friends back together again. And, with the help of a new mini-documentary, he’s hoping to do just that. Put together by Uproxx, the following video is the first in a three-part series about one of the most iconic rock bands in history. (The following installments will be released on Wednesdays over the next two weeks.) Most of it is devoted to clips of Canter showing off the old practice space, memorabilia from that time, and talking about his friendship with the band. There’s also a brief appearance from Duff McKagan, a.k.a. the sanest member of Guns N’ Roses, discussing Canter’s association with his group. Notably absent from the footage is any interview with Slash or Rose, suggesting that Marc Canter has a tough sell ahead of him. But if he pulls it off, there will be more than one hard rock fan lining up to shake his hand—and probably more than a couple of label reps hoping to do the same.